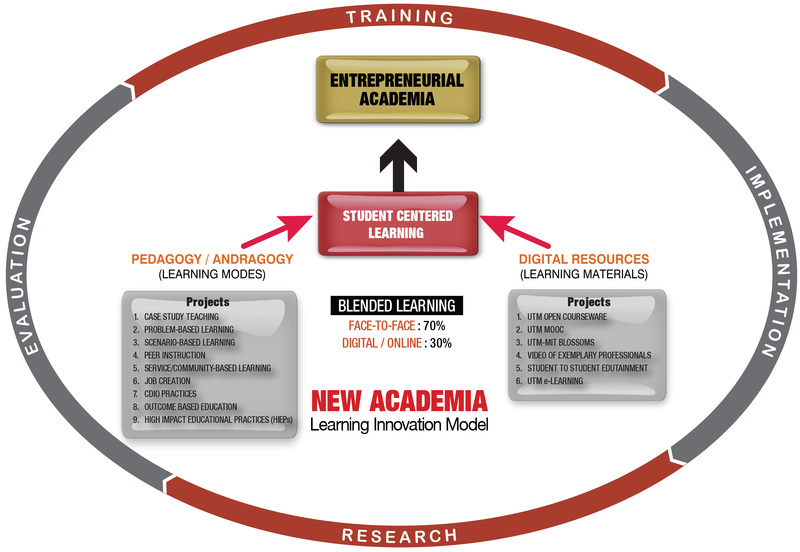 Centre for Teaching and Learning (CTL), UTMLead has been given a great responsibility to carry out initiatives under the New Academia Learning Innovation (NALI). NALI emphasizes the concept of entrepreneurship. By entreprenuership, we refer to the context of learning that is more productive, creative and innovative (Zaini, 2012). The following figure shows the model of NALI. 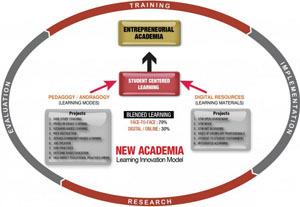 There are two modes under NALI – Pedagogy/ Andragogy and Digital Resources, all of which contains 15 projects. In support of Dasar e-Pembelajaran Negara (DePAN), UTM through NALI runs courses that implement blended learning approach. The term blended learning is defines as the practice of using both online and face-to-face learning experiences when teaching students. 30 to 80 percent of the course content is delivered online. Face-to-face learning covers Case study, Problem Based Learning, Scenario Based Learning, Peer Instruction, Service Learning, Job Creation, CDIO and OBE. Digital learning involves the use or development of internet and video material such as Open Courseware, MOOC, BLOSSOMS, Video of Exemplary Professionals, Student to Student Edutainment, OBE Analysis System, and UTM e-Learning. To align UTM teaching and learning models, activities, materials, environments and systems with Malaysian National Higher Education Strategic Plan, needs of employers and requirements of accreditation bodies. To emulate best teaching and learning practices from the World’s best universities. To develop UTM own identity related to teaching and learning models, activities, materials, environments and systems. To create meaningful and interactive learning activities, materials, environments and systems appropriate to UTM Graduate Student Attributes.